“Fede, Zitto! Shut up. You want a smack?” asks his mother, a round woman in her mid forties. 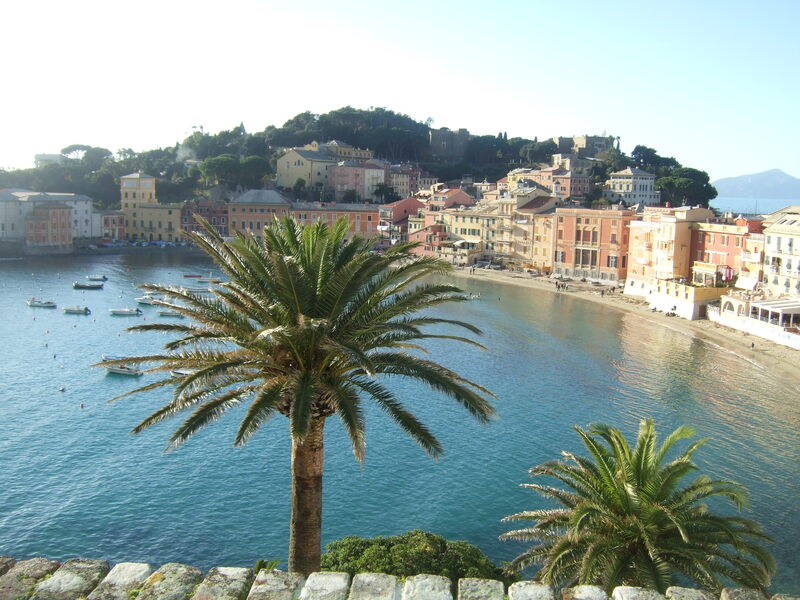 Dressed in black stretch pants and a black sweatshirt, she sprawls on the beach ringing the Bay of Silence, a sandy crescent on the Eastern side of the peninsula of Sestri Levante. 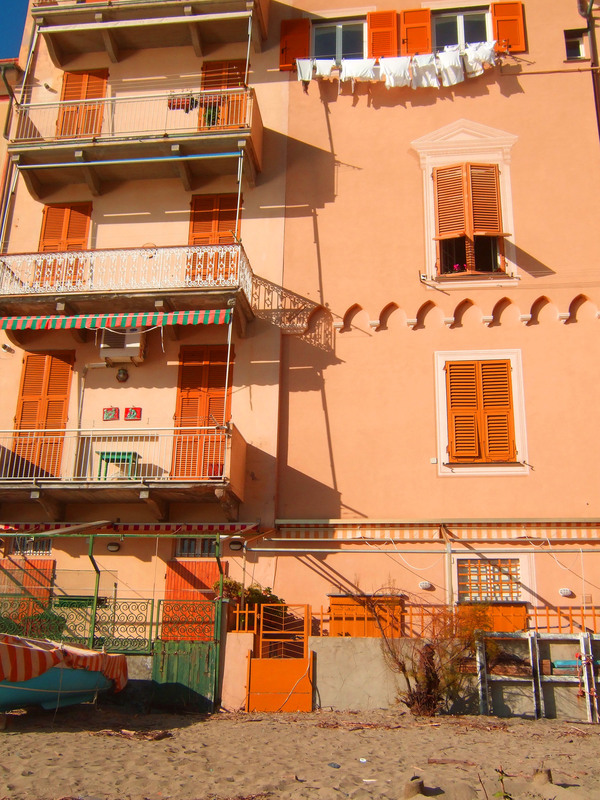 An unseasonably hot sun shines over the terracotta roofs of the pink-and-yellow ex-fishermen’s homes that stand as a backdrop to the water. 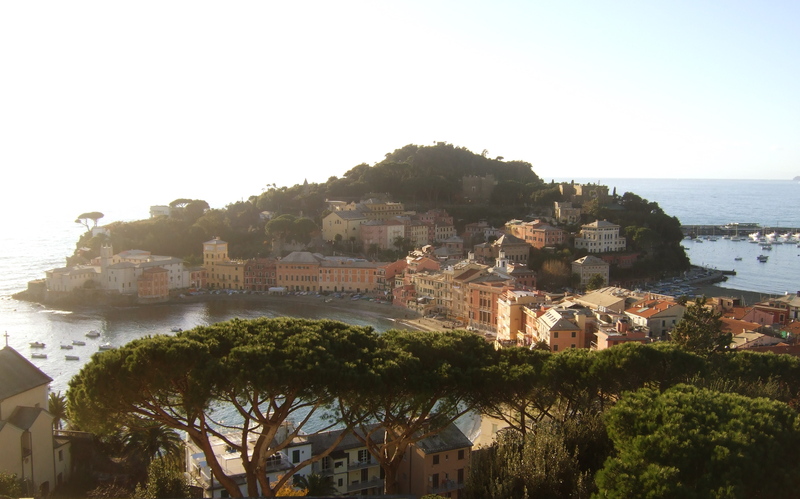 The woman in black is in Sestri on a day trip with shopping and picnicking her twin objectives. Piles of bags from Sottovento (a clothing shop), Top 2000 (a shoe store), Tosi (a bakery specializing in pizza and focaccia), Marco’s (a fruit vendor), as well as her accent (Milanese), attest to her transient status. Next to her, sharing her towel, lies her husband, also in black. Nearby, Fede in jeans, a sweatshirt, a cap and a bandana, digs in the sand with his red shovel. His older brother, outfitted in an identical manner, buries his own feet in the sand. 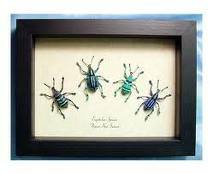 The four glisten like sunning beetles on fine white granules. “But Mamma, why? Why can she go in the water?” Fede asks, squinting, pointing toward the horizon. “Because her ball rolled in.” The woman sighs, not looking up from Chi? gossip magazine. She’s reading a back issue about the American émigré showgirl, Heather Parisi, who recently gave birth to twins at age fifty. “Watch it, stupido,” says his father. He raises himself to an elbow, spits out some granules and brushes off his shoulders. “I’m not stupido,” says Fede. “Shut up Fede! I’ll ring you like a bell if you don’t stop nagging. Have a tangerine?” She fishes one out of the bag of fruit, but Fede doesn’t take it. “Can’t I take off my jeans and my sweatshirt? Like those kids?” Fede points to some boys playing soccer. “Absolutely not. It’s Autumn. The summer’s long over.” Tilting her head, his mother frowns. “Listen to how they talk, Fede,” she says. “Do you know what language that is?” She hands the half-eaten tangerine to her husband to finish. “Do you suppose these tangerines were imported?” asks her husband, chewing slowly, a scowl compressing his features into a net of black lines. She shifts her attention toward her elder son who has run to join the red-headed, soccer-playing English boys in underpants. Fede’s brother takes over the ball, kicks and it bangs against a metal gate at one of the ex-fishermen’s homes. 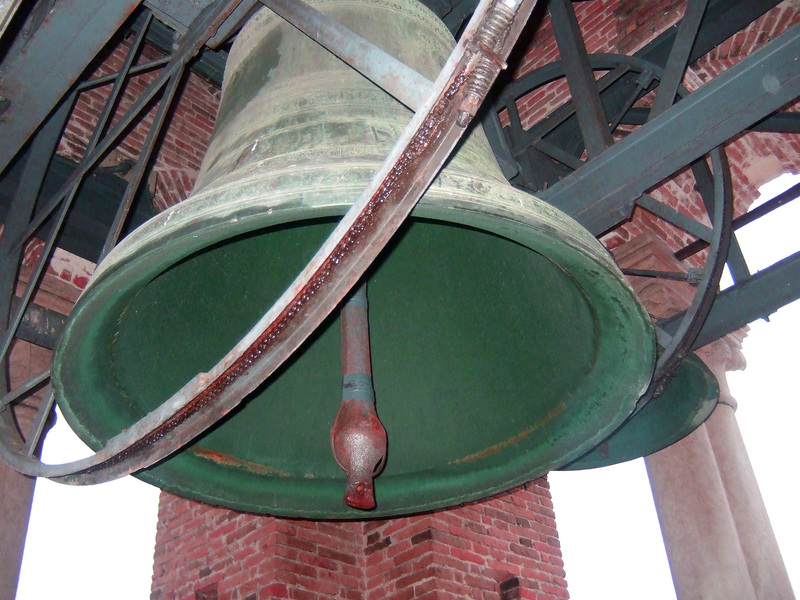 He grins at the echoing ring of reverberating metal. A sparrow hops and pecks around the edges of the towel where miniscule focaccia crumbs from lunch glisten. The woman waves her hands. Startled, the bird splats a ring of white on the sand and then, with quick flicks of its brown wings, flies off. “Me too!” Fede interrupts with a shriek. He watches his brother run toward the water after the soccer ball. “I’m going into the water too!” Standing, he unbuttons his jeans. Fede digs. Lori plays soccer. The woman licks an index finger and then turns a page in her magazine. Her husband stands. “Can’t you relax?” asks the woman, looking up and squinting into the sun. Giorgio sighs. “Fede, you’ve made your mother mad,” he yells. “She’s always mad,” says Fede, yelling back. On the shore Fede’s feet slap against the wet. A wave crashes and Fede laughs, running from the foam. “True,” says his father. “Come on.” He grasps Fede’s hand and the two walk toward the old Dominican monastery at one end of the beach, searching for seashells. The woman in black sinks back into her towel. “What paranoiacs,” she decides. 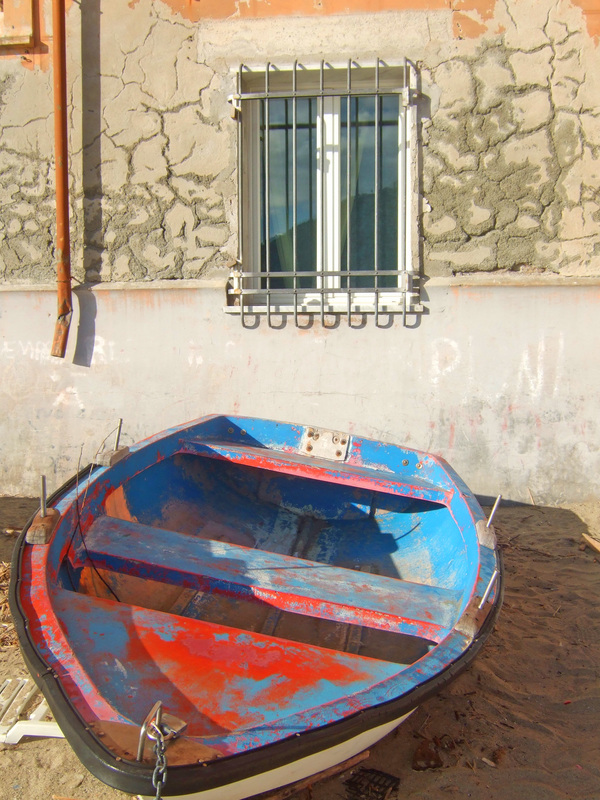 “If only I’d had .…” the unfinished sentence hangs in the summer-like air. 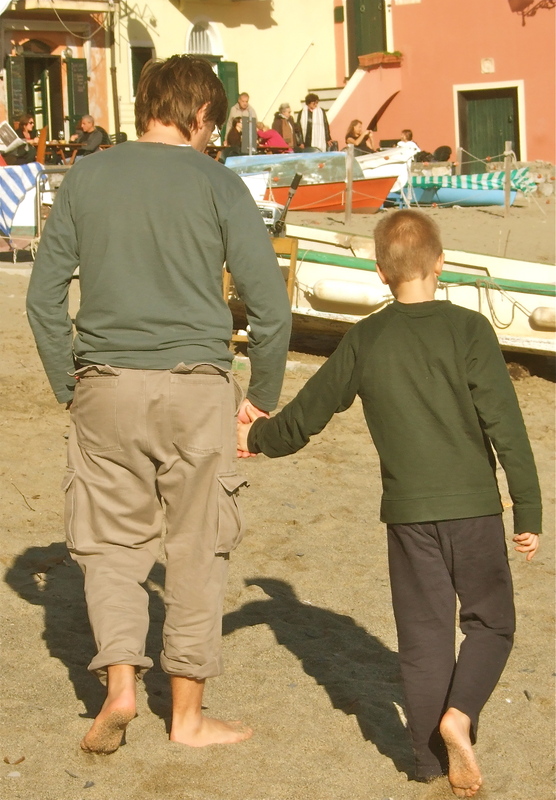 When Giorgio and Fede return without any seashells, Fede jumps on his mother, crumpling her magazine under his weight. “Uffa!” says the woman, pushing him off. “Federico, I swear, I’ll ring you like that big bell in the church over there.” She points to the striped Capuchin monastery at the other end of the bay. “Sit down. 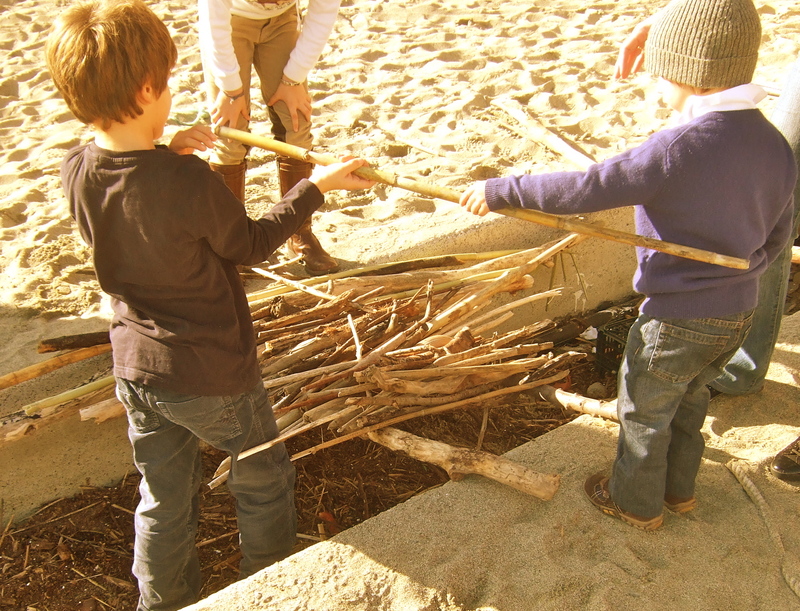 Make a castle,” the woman hands Fede his shovel. Fede flops into the sand but he doesn’t dig. He watches his father, pacing back and forth in front of their towel. His mother, after having smoothed out her reading material, rolls her eyes. “You weren’t serious, were you, Gloria?” Giorgio asks, stopping, pushing his Raybans up on top of his unruly black-and-gray curls. Underneath the buildup of oily sweat, his skin is green. “You know,” Giorgio nods at the magazine. Giorgio flops belly down next to his wife. He closes his eyes. Soon Fede digs. Gloria returns to her magazine. Lori, two hundred meters away, playing soccer with the English boys, aims the ball at an old lady dozing in her mink coat on a beach chair but misses. A short time later, the ball smacks a fat man who was sleeping on a towel and digesting his lunch. Lori raises his hands in apology. “So you’re an Inter fan.” The man says, eyeing Lori’s sweatshirt. “Genoa isn’t in the A league,” Lori says over his shoulder, running off. “Of course,” he says. “Why not?” He lies down again. “I know. You couldn’t stand it,” she laughs and kisses him on his forehead. “Not yet. In a minute. The sun is doing us good. So relax. 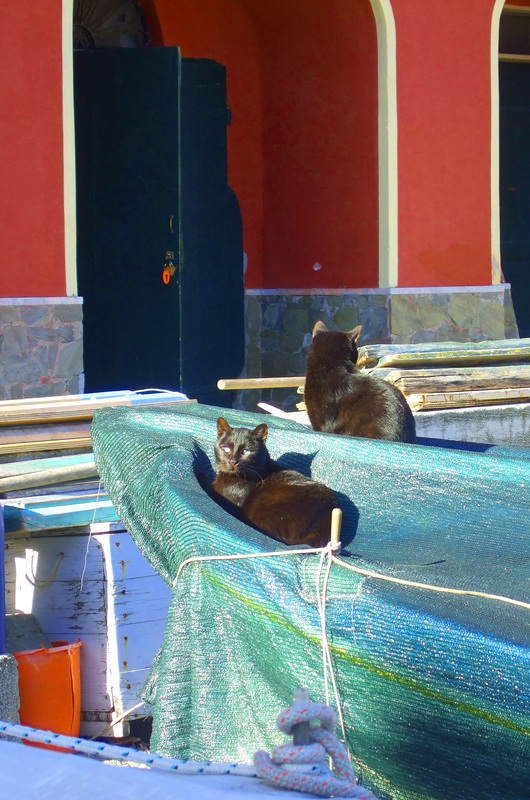 Can’t you relax in the sun?” She stretches like one of the shiny stray cats arrayed on the fishermen’s rowboats behind her. Beached for the winter, the boats hulk under green or blue tarps and provide bad-weather housing to the town’s burgeoning feline population. “I want to swim!” Fede kicks at the sand. “Now!” Fede starts to cry. His face flames with a red flush. “I don’t care,” says Fede. He throws sand with his shovel. “Lori, lower your voice,” yells his father. “I’m tired,” yells his father. “Oh, all right,” says Lori. With their shovels, Fede, Lori and a little red-headed girl in a wet undershirt dig a hole in the mountain of sand they’ve just built. Deep inside the crater they will bury the lava: a piece of Giorgio’s crumpled newspaper with pictures of Berlusconi and the young woman with whom Berlusconi has been creating a din in the headlines. When the paper’s buried, with a tip sticking up, Giorgio will light it so that flame and smoke billow forth. “You’re rude, you know that Lori?” says his mother. Lori sticks out his tongue, stomps on the volcano and dodges his mother’s swinging arms. Fede cries at the destroyed volcano. Tears track glistening trails through the dust on his face. The little red-headed girl runs off. “Basta! Gloria! We’re going. Enough,” says Giorgio, jumping to his feet. “This is more than any sane person can stand.” His forehead creases like the water in the bay as breezes waft through. Behind her back, Fede lifts his head, loosens his bandana and lets the air cool his cheeks. Giorgio and Lori head toward the sidewalk and the municipal water fountain where beachgoers stoop to rinse body parts with free city water. Gloria folds the towel and shoves it in her black-patent-leather bag. Straightening up, she watches her husband stick her son’s foot under the jettison of blue. 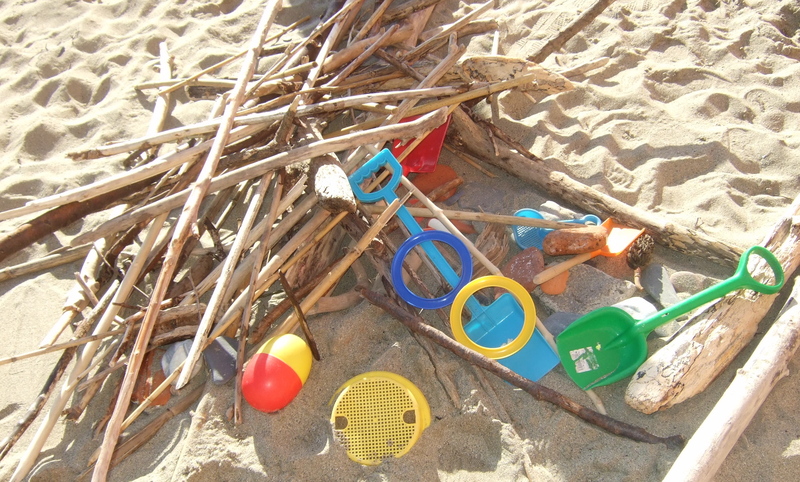 While his parents attend to Lori, Fede is alone on the beach. 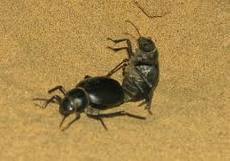 He wriggles out of his pants and sweatshirt and bandana and sunglasses and abandons the unwanted sheath in a pile on the sand. He races to the water. A wavelet froths around his feet. He sinks to his knees and another splashes against his chest. 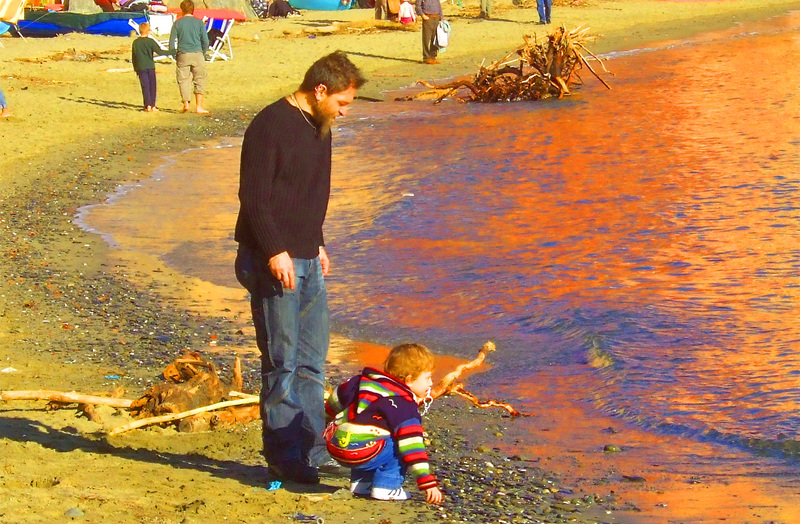 In his underpants, kicking his feet, he laughs and rolls on the slick bronze shore littered with round gray pebbles. His white briefs turn translucent with the seawater then opaque as nubby sand sticks. A mostrar le chiappe chiare! Two more minutes filled with the wanton breaking of bewildering rules ensue before Fede’s mother drags him out of the bubbling waters by a dripping foot, rubs him down with a sandy towel and then rings him like a bell, but they’re the two best minutes of his day and possibly of his entire childhood. This is how it happened, DG, word-for-word, play-by-play; without inserting myself or my opinions into the surging whirl, I have duly transcribed the arbitrary array of strange rules and funny customs operative in a foursome’s conflicting, elusive quest for quality time. Like the red-headed English cavorting in their underpants in the rolling Ligurian surf, I’m an outsider in this country, one I’ve adopted and often revel in, but which will never completely be my own. To bare our little white cheeks! Natalie, Thank you for some quality reading time on NC. 15:02 provided a particularly delightful moment. I enjoyed reading it and loved the wonderful photos too. 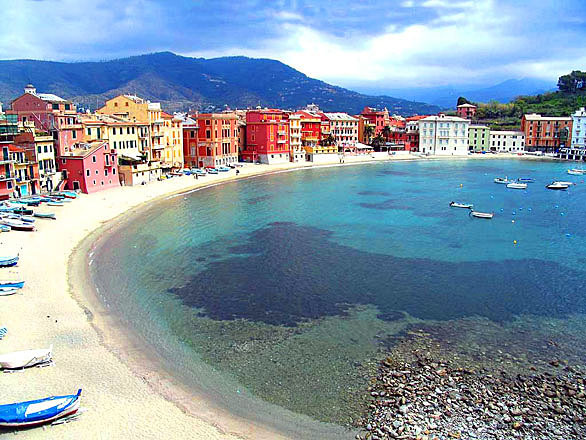 I hope we can visit Sestri Levante together in the near future. Happy New Year! Thanks Margie, I hope you come too! Terrific story, Natasha! I’m glad that Fede got a chance to swim! 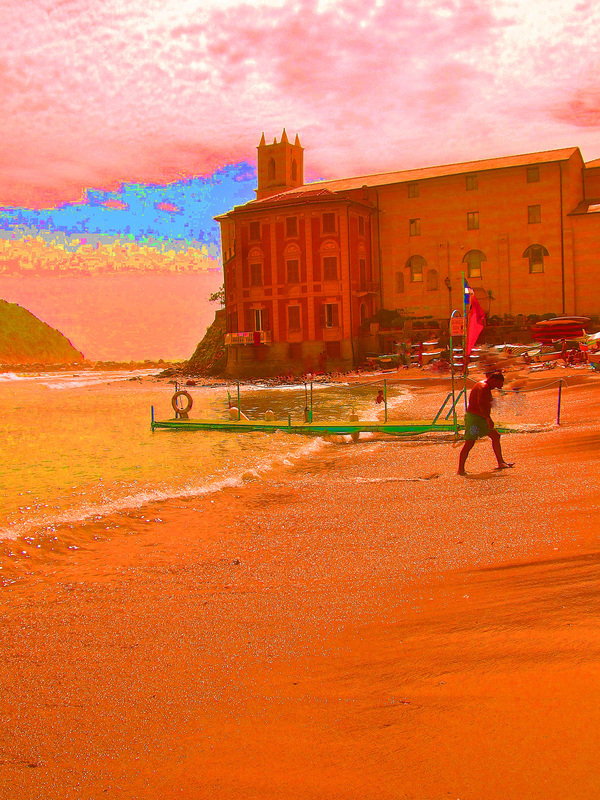 I think we were in Sestri Levante for an afternoon a few years ago. 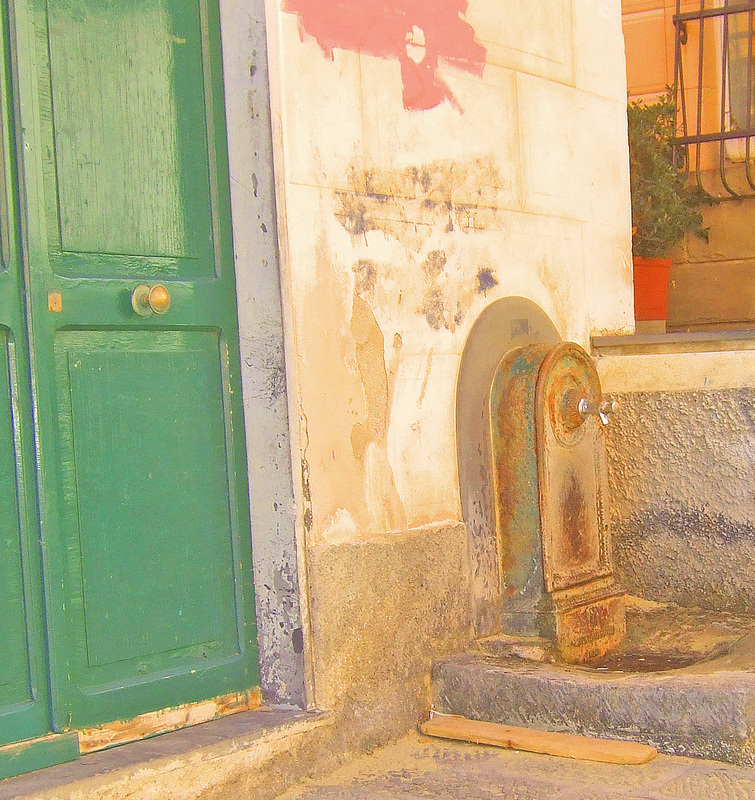 I got in trouble for washing my feet in the yacht club’s fountain, as I didn’t see the public fountain–the woman who was cleaning there started with a grumble that grew into a tirade at ignorant tourists. Thanks Kim. We must have crossed paths without knowing it. Unfortunately the secret NC handshake hadn’t yet been devised in those days. 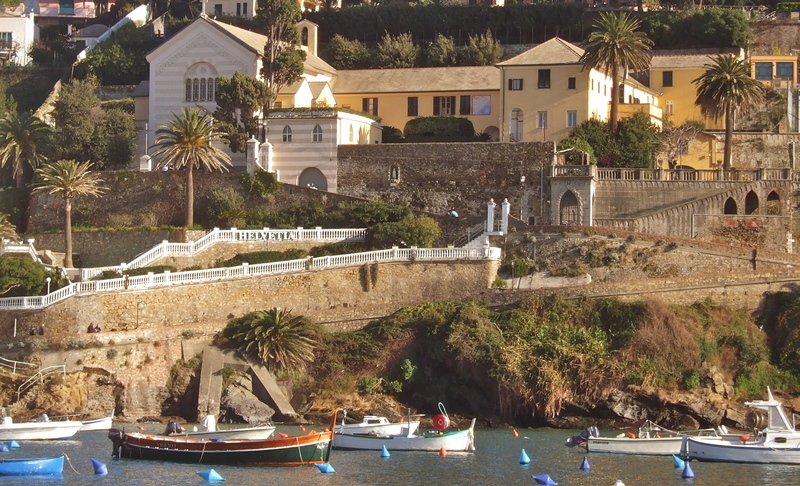 Too bad, it would have been fun to see you in Sestri! Lovely once more, Natalia, and once more I’m jealous. Do you have a guest house? Thanks Francie. Another excursion, by all means!